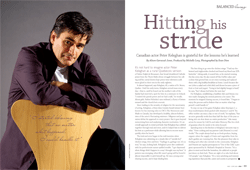 It’s not hard to imagine actor Peter Keleghan as a rural Quebecois version of Father Ralph de Bricassart, that broad-shouldered Catholic priest from the Thorn Birds whose struggle between his calling and his carnal desires kept prime time television audi- ences glued to their sets in the early eighties. It almost happened, says Keleghan, 45, a native of St. Bruno, Quebec. Until his early teens, Keleghan served mass every day—that is, until he found out his mother’s side of the family had reserved a spot for him in a seminary in Ireland. “I visited the parish priest and we had a talk,” he recalls. About girls. Father Nicholas’s eyes widened, a flurry of letters ensued and the church lost a recruit. Since trading in the security of religion for the uncertainty of acting, Keleghan, a three-time Gemini Award winner best known for his starring roles in CBC’s The Newsroom and Made in Canada, has developed a healthy, almost holistic, view of the actor’s fluctuating existence. Diligence and preparation define his approach to every project. But it goes beyond memorizing lines and analyzing character motivation. It’s an overall approach to mind and body that Keleghan has cobbled together through trial and error, and it’s helped him to deliver his best as a performer while allowing him to recover more quickly when he hasn’t. The trial and error began in his mid-twenties when Keleghan was subsisting on a steady diet of “suicide-hot” chicken wings, fries and beer. “‘Garbage in, garbage out,’ it’s so true,” he says, looking back. Keleghan’s poor diet combined with his perfectionist nature spelled trouble. “I got depressed when things didn’t happen in a way I thought was my best.” A pattern was emerging; when life wasn’t going well he found it almost impossible to pick himself up. He was a young actor chasing success, and it kept eluding him. An office worker can miss a day or two of work,” he explains, “but an actor generally works less than half the days of the year so being sick can shut down an entire production. To stay on top of his game Keleghan takes Emer’gen-C, a fizzy multivitamin drink packed with vitamins C and B. “An office worker can miss a day or two of work,” he explains, “but an actor generally works less than half the days of the year so being sick can shut down an entire production.” Like many actors he swears by Cold Fx and takes Memory Plus for a kick of guarana when he needs to be extra focused.